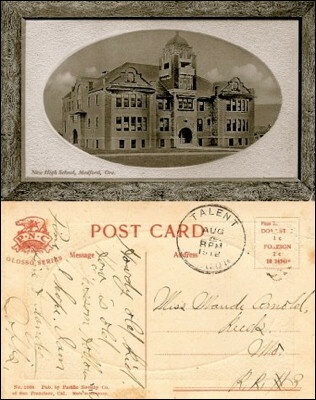 Front and back of a 1912 postcard: "New High School, Medford, Ore." It was sent to my Grandma Maude in Missouri from someone in Talent, OR named Dobbs: "Howdy old kid. How is old "Possum Hollow"? Fine I hope. I am fine and dandy. Dobbs."